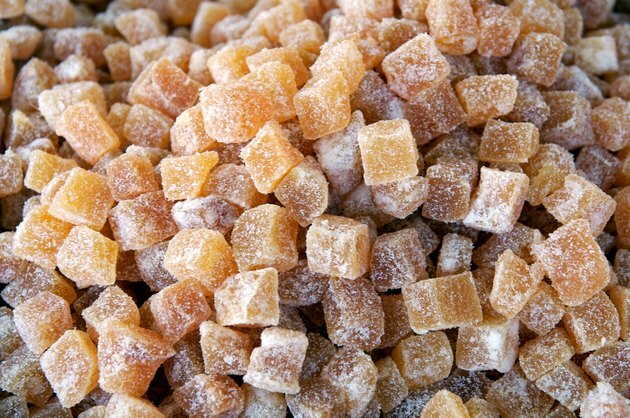 Ginger chews are made from pieces of real ginger root, which means they contain its natural active ingredients. At least 14 bioactive substances have been identified in ginger root. The most abundant essential oils in fresh ginger -- called gingerols -- have antioxidant and anti-inflammatory abilities. But ginger is best known for its ability to alleviate nausea. A basic ginger chew consists of a slice of ginger root that is boiled in water to soften it and then coated in sugar. You can also find ginger chews flavored with a variety of ingredients, such as coffee, apples and peanuts. Check the label on the chews you buy to see how much sugar they contain. One major brand reports its ginger chews have 4 to 5 grams of sugar per chew. If you ate 6 chews, you would consume about the same amount of sugar as in a can of sweetened soda. Current scientific research supports the old-school advice to take ginger for an upset stomach. Its ability to relieve nausea is attributed to the way it expels intestinal gas and accelerates the movement of food out of your stomach, according to research cited by "Herbal Medicine." Ginger significantly relieves nausea in pregnant women, according to a review of research published in the March 2014 issue of the "Nutrition Journal." It may also help treat nausea caused by chemotherapy, but more research is needed to verify its effectiveness. Ginger root's antioxidant capacity is surpassed only by pomegranate and some berries. While researchers haven't targeted the exact way it works, studies cited by "Herbal Medicine" show that ginger reduces inflammation and may relieve pain. These characteristics also contribute to its potential to prevent cancer. In laboratory studies, ginger's anti-inflammatory ability inhibited the growth of ovarian cancer cells, reported an article published in "BMC Complementary and Alternative Medicine" in December 2007. More recently, a review of research published in the July 2011 issue of "Critical Reviews in Food Science and Nutrition" concluded that its antioxidant properties have a role in cancer prevention. The U.S. Food and Drug Administration includes ginger on its list of essential oils generally recognized as safe. Few side effects have been reported when it's consumed in small doses. Some of the common side effects associated with ginger include heartburn, gas, bloating and nausea. Be cautious about the number of ginger chews you eat because you won't know the amount of bioactive substances they contain. Since ginger chews are sold as candy, they carry the standard nutrition facts label, which shows calories and nutrients but does not itemize active ingredients. Is Crystallized Ginger Good for You?